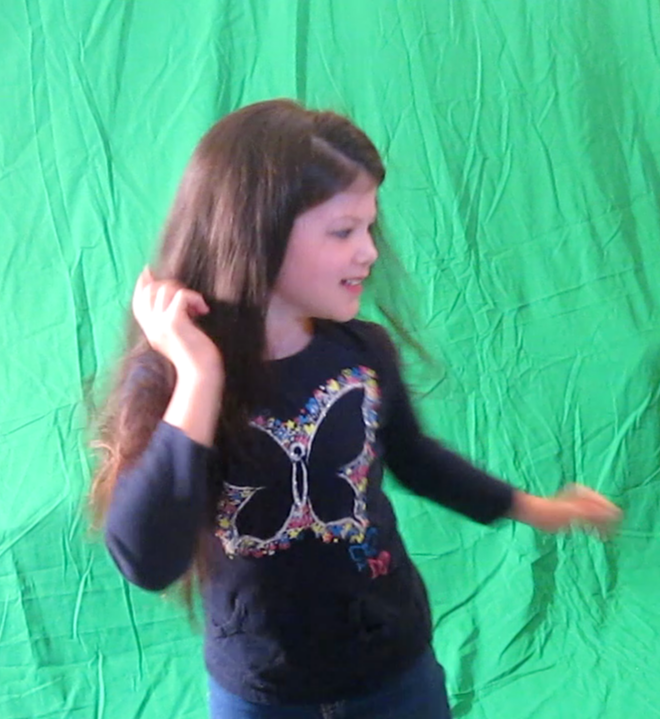 It was exactly one month ago that we posted the video of our daughter Cynthia doing a parody of the 4-Clone Dance party from the season two finale of Orphan Black. I've retold the story behind it enough times that I've decided to blog about it. First of all I should mention that my daughter, Cynthia Galant is fortunate to have been cast in a small role in the TV series 'Orphan Black'. If you don't know the show, I highly recommend you checking it out. It's terrific. Original, great characters, and very exciting. Tatiana Maslany plays several clones in the show and each one has a completely different look and personality. I can't say enough good things about her, the show and its cast and crew. Even if my daughter wasn't involved with the show I'd be a fan. My daughter has played the younger version of one of the clones named Rachel and another, new clone named Charlotte. I will say nothing else in case you haven't seen the show or that episode yet. After season two's finale aired, the cast and crew thanked the support of the fans with photos specifically for Cloneclub (the nickname for the fans of Orphan Black). Cynthia modeled hers after Tatiana's pose from last year, and gave herself the moniker 'mini-clone' when signing her name. There were a lot of positive comments and appreciation from the fans. 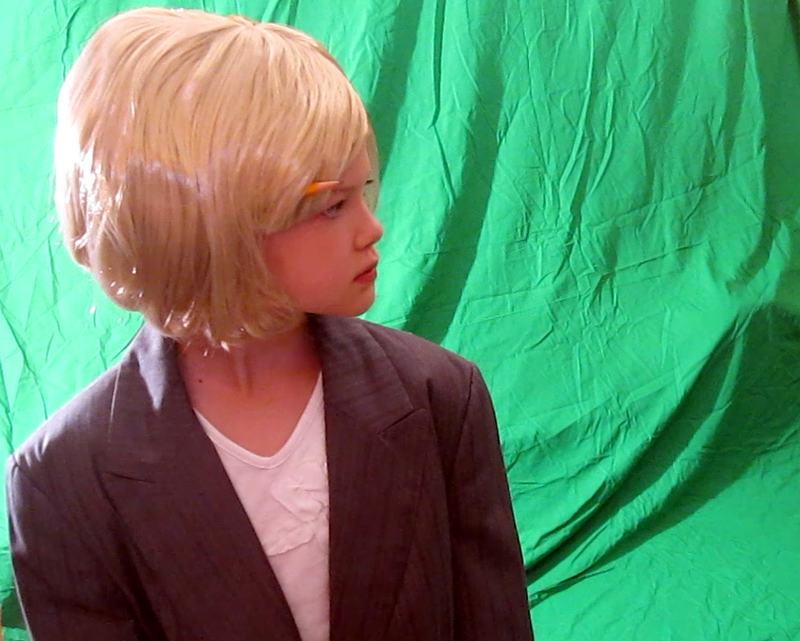 One sent me a message saying they'd love to see Cynthia in a webseries dressed up as a mini version of all the clones. I read it aloud to my family and we all thought that it would be fun, but from being in show business for a while, we knew that unions and copyrights would make it problematic. We didn't want to accidentally infringe on any cool ideas that the writers of Orphan Black might use in the future, either. Now, I should mention that even though my daughter is in the show and there is another adorable little actress, Skyler Wexler, who is about the same age and plays the daughter of a clone, this show is not for kids to watch. So, as a responsible parent, my daughter has never seen a full episode. She has been shown the scenes she's in, and select clips that I thought she would enjoy (her favorite is Helena's Sugar Sugar). One of those was the 4-clone dance party in the season two finale. It was a great moment in the show where Tatiana Maslany plays four of the clones dancing together. It is amazing to watch. My daughter watched this video over and over and over and over again. She then asked me, "Can we do a video of me dancing like this?" I looked up to ask her what she meant and saw her dancing smoothly and gracefully like Cosima, then suddenly switched to the prissy, reserved bops of Allison, then the funky shoulder sways of Sarah and then the frenetic frenzy of Helena... all within a few bars. I laughed because I forget how good of a mimic my daughter can be. It was just too good not to share. I thought about that for a moment. Not only would this be a fun way for Cynthia to 'play' the grown-up clones, but also a learning experience in case she has to do blue- or green-screen work for the show. I said, "Sure! A parody of the dance would be funny and easy to do." Well, my wife pooled the costumes together from what we had around the house, including wigs we had in storage. We only needed to buy the one wig for Helena which was an 80's Rocker Wig (ala Twisted Sister) for $12.00 at a party store. Then on one of our hottest days of the summer so far, I set up my green-screen and 1K lights in our living room. Yes, we have odd costume pieces, wigs and our own green-screen... doesn't everyone? Since we didn't have a 'Felix' for the video, we decided to honor his character by having a couple of pieces of 'his' art as set dressing. Cynthia and my wife recreated two of the pieces together. Compare the two videos and see if you can find the two that they chose. We quickly decided where each clone needed to be, practiced a few times with the same music as the original (Water Prayer Rasta Mix - Adham Shaikh) and shot it all in an afternoon. One very long afternoon. Unlike the one in the episode, I did not include any camera movements because I don't have the resources of Intelligent Creatures (the visual FX company for Orphan Black). We also didn't have any close-ups to worry about. When the shooting was complete and my daughter had changed her hair, costumes and make-up five times, she exclaimed, "Tatiana does this every week??" Cynthia suddenly had a whole new appreciation for what Tatiana goes through and how much work the hair, make-up and costume department do to achieve the different looks. After two days of editing on my laptop using HitFilm 2 Ultimate to composite the different layers, I uploaded it to YouTube. We had hoped to get 300 views, mostly from our friends and family and a few fans. The first to 'like' it, comment and share it was BBC America who produces Orphan Black. The second was Orphan Black itself, who also put it on their Facebook, Tumblr and Twitter. By the end of the first day we had 10,000 views. We are now up to 45,000 views and counting. There have been several blogs and articles about the video and even an animated gif made by a fan comparing the two routines on Tumblr (click here to view). We had no idea how many Cloneclub fans there were in the world until I started seeing the stats from the video. It has been viewed and shared in over 75 different countries - even places I didn't think would watch Orphan Black... like the Middle East. We think this is wonderful! The very last frame shows the 5 clones, including Rachel scowling at them. We had originally planned to do a gag near the end of the routine where Rachel disapproves of the dancing shenanigans, but Cynthia's mimicking of the dance was so good that I didn't want to interrupt it - so I cut that idea during the editing. Thanks to everyone, and looking forward to season three! And if you haven't watched the show, seasons one and two are available on DVD/Blu-Ray and iTunes.